YOUR DESTINATION FOR GREAT TIMES, REGIONAL & NATIONAL ACTS, ATMOSHPERE, AND FOOD! We are the purveyors of incredible food, craft beers, killer cocktails and live music! We are located on the corner of Country Club Rd and Highway 81 in Chickasha, Oklahoma! 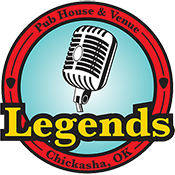 Legends Pub House and Venue is Chickasha’s newest dining destination and bringing all the fun and entertainment to Southwest Oklahoma, Steeped in history and designed with character, The Legends Pub House offers an astonishing menu and well crafted alcohol selection. Have your local favorite craft beer brewers on rotation as well as domestic bottled beers always on hand. Belly-up to the bar and try our signature cocktails, or our Legends flight O’ beers. Savour our delicious new menu, the perfect accompaniment for your wine, beer, or cocktail. Pub House Menus COMING SOON!